ROLAND ARMITAGE HOOVER of Bethesda, Maryland, passed away peacefully at home on Wednesday, November 7, 2018. Born on January 14, 1929, in Buffalo, New York, he attended Ossining High School and Yale University, earning a BS. in Industrial Administration in 1949. He served as a Lieutenant JG in the United States Navy during the Korean War. In 1962 he married Cynthia Lee Adams, and they had two daughters, Sarah and Emily. What began as an after-hours hobby grew into a full-time avocation. Roland designed countless posters, announcements, keepsakes, and books for organizations including the Smithsonian Institution, National Gallery of Art, Library of Congress, and Yale University, as well as for his parish, St. Columba’s Episcopal Church. He worked as Director of Publications at the Brookings Institution and as Yale University Printer. His printed works are characterized by quiet elegance and restraint, letting the text of each piece guide his design. The typefaces and ornaments he used, which he carefully selected to draw out the meaning of the text, made simple design statements in and of themselves. Roland saw himself not only as a designer but also as a craftsman. 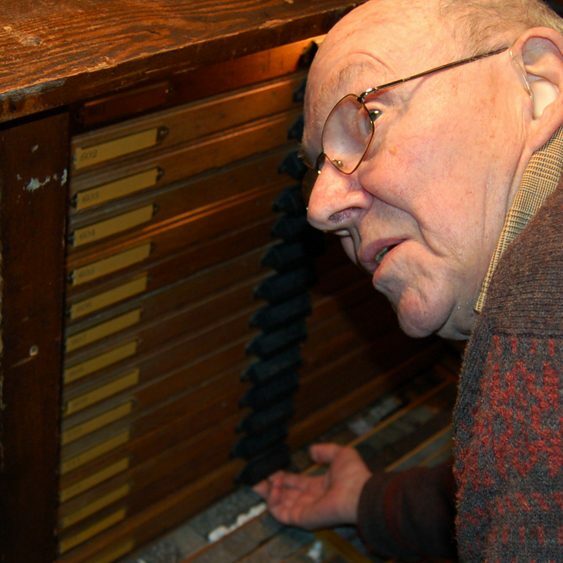 Letterpress printing is a tactile endeavor, and Roland loved every aspect of it, from hand-setting type letter by letter to the feel of that type pressing into the paper as he operated his Vandercook press with its sturdy metal crank. He spent hours upon hours in his shop, working out designs, selecting paper, running off new proofs, and producing sometimes hundreds of copies of his works. Throughout his years of printing, Roland was blessed to have belonged to various fellowships of ”ink-stained wretches,” as he liked to say, most recently the Chesapeake Chapter of the American Printing History Association (APHA). He readily made himself available for design and technical advice with those in the printing community. While Roland had strong opinions about typefaces and was not shy in criticizing those he disliked, he was always encouraging when offering critiques one-on-one. Roland loved to read, especially literature and history. The Complete Works of Sherlock Holmes never left his bedside. Other nightstand favorites included a well-worn and marked copy of The Uses of the Post, as well as all of Willa Cather, Charles Dickens, and Anthony Trollope’s published works. The inaptly named ”Compact” edition of the Oxford English Dictionary would have found its way to the bedroom, had each of its two volumes not weighed an impressive 11.7 pounds; instead, it lay open next to the family room table, frequently consulted or simply perused. Possessed with an unusual wit, his puns will only be treasured by those who understood them properly. Roland is survived by his wife Cynthia, his daughter Sarah Adams Hoover and son-in-law David Ware, daughter Emily Hoover Dooley, and grandchildren Helena Adams Ware, Eleanor Clare Dooley, and Owen Josef Dooley. Contributions may be made in Roland’s name to St. Columba’s Episcopal Church Music Fund, 4201 Albemarle Street, NW, Washington, DC, 20016. For information about contributing to the Roland Hoover Fund for Excellence in Typographic Design and Letterpress Printing, email hoovermernorial@yahoo.com.